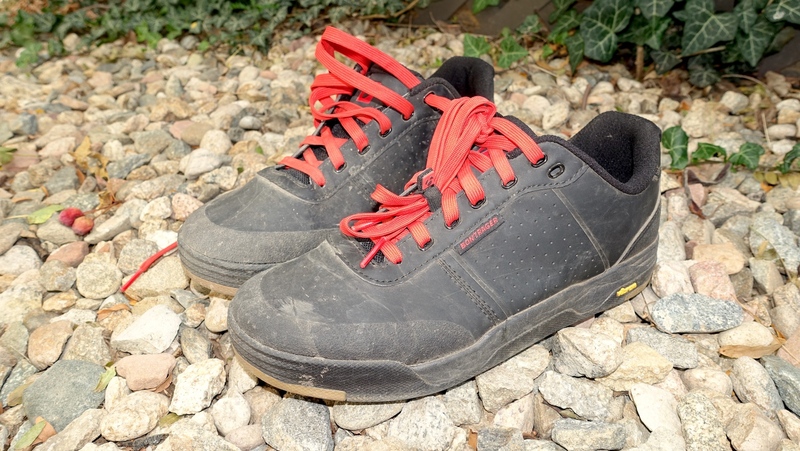 The Bontrager Flatline mountain bike shoes are worth a look for any flat pedal rider. The Bontrager Flatline Mountain Bike Shoes offer great pedaling efficiency, low-key looks, and good value for flat pedal mountain bikers. Top line features include a Vibram rubber outsole for an optimized shoe-to-pedal interface, uniform tread pattern that provides consistent, and a predictable interface between pedal and outsole. 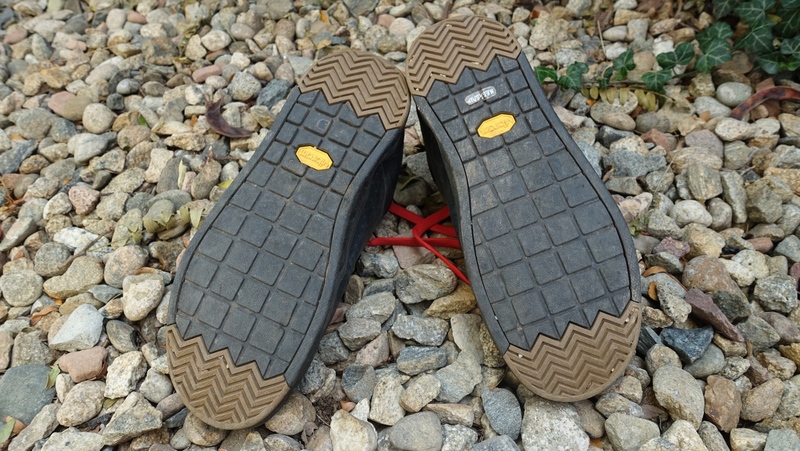 Directional tread at the toe and heel gives off-bike scrambling traction, uphill or down, and they have a shock absorbing EVA midsole and durable, synthetic leather upper. The Bontrager Flatline shoes bring top-of-the-line performance at a reasonable $130 price point. Vibram soles provide great traction on any pedal while still making quick foot adjustments easy. And the upper is comfortable and slimmer in many aspects than other flat pedal shoes I’ve used in the past. The Bontrager Flatline’s Vibram sole offers a perfect blend of pedal traction while still making foot adjustments quick and easy. I found the Bontrager Flatline shoes to be quite comfortable right out of the box. They seemed to have a shorter break-in period that I’ve experienced with other flat pedal shoes. Because of my low instep and overall low volume foot, I threw in a set of insoles that supported my arches better and took up some space. 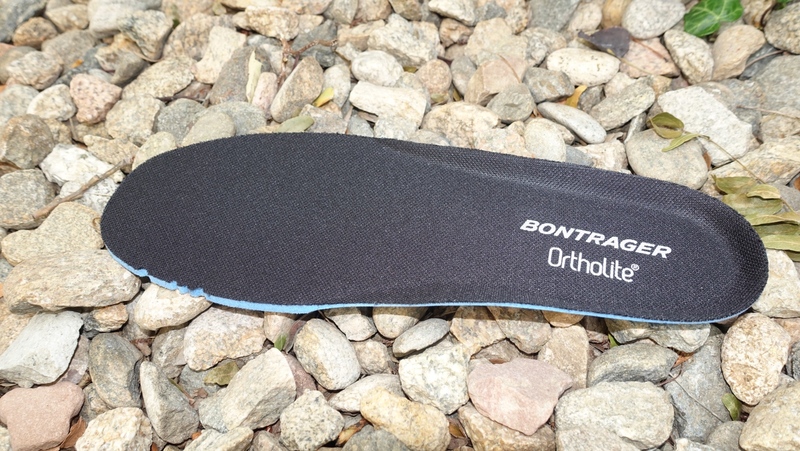 That said, the Bontrager Flatline’s included Ortholite insoles are comfortable and will work nicely for riders with larger volume feet and lower arches. The materials used in the Bontrager Flatline are lighter and lower profile than those found in similar 5.10 options. 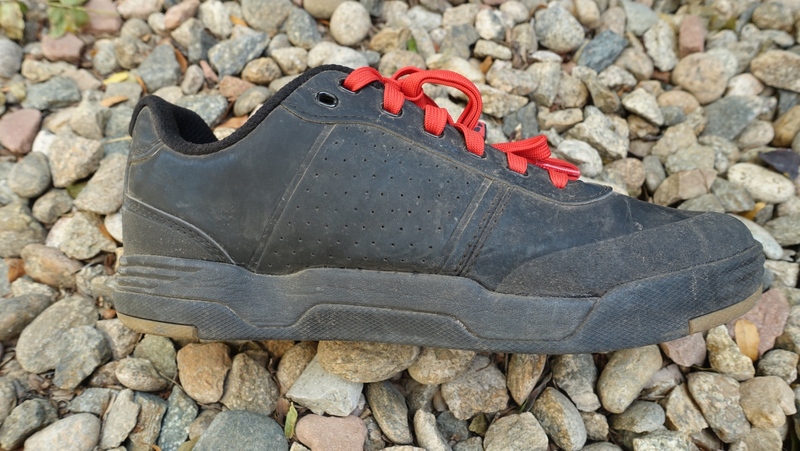 As with any MTB shoe review, I have to compare the Bontrager Flatlines with what many consider the gold standard of flat pedal shoes, those from 5.10. I’ve ridden in a pair of 5.10 Freeriders for quite some time and the differences between them and the Bontrager Flatline are noticeable. First off, the Bontrager Flatlines are not as sticky as the 5.10s. But for some riding or riders, that may not be a bad thing. With good technique, I never experienced any inadvertent slips off the pedals while wearing the Flatlines. But I do think that they make quick adjustments of your foot’s placement on the pedal easier than my 5.10s. It’s a balancing act and one that I think the Bontrager is doing nicely. The addition of a lace keeper isn’t revolutionary but certainly appreciated. In terms of fit, the Bontrager Flatlines have a flatter last shape than the 5.10s. I’ve actually found that this suits my foot better than my 5.10s and other models with more toe spring. That’s a highly personal fit concern but certainly worth noting. Even off the bike, I still found walking and hiking up steep pitches comfortable (or as comfortable as hike-a-bikes can be) in the Bontrager Flatline shoes. The lack of curvature in the sole didn’t impede off-bike movement at all. Another perk of the Bontrager Flatlines is their weight. They are 70 grams per shoe lighter than my 5.10 Freeriders. That may not sound like a lot but it’s enough to appreciate by hand. The materials of the upper also seem more hydrophobic than my Freeriders, so they are significantly lighter in wet conditions as they don’t absorb as much moisture. The stock Ortholite insole is comfy and will suit riders with lower arches nicely. Otherwise, don’t hesitate to replace it with something that fits your foot better. 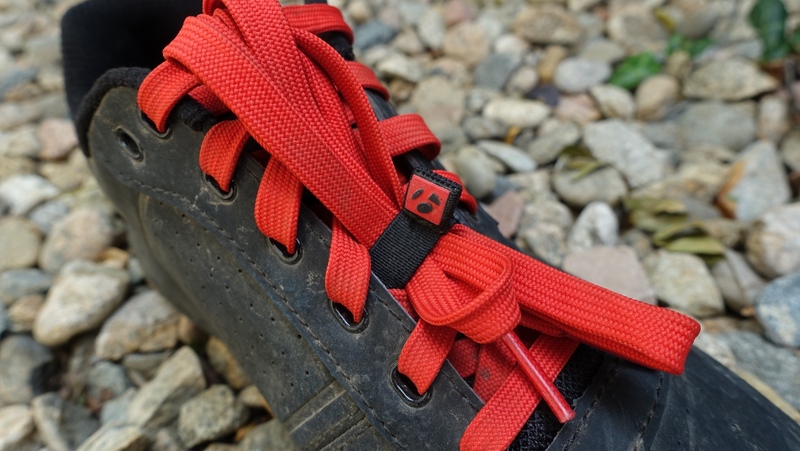 As with any lace up shoe, I like that I can cinch the Bontrager Flatlines down tightly in summer months when I like a thinner sock, but open the shoe up and wear thicker wool socks in cooler months. The toe box of the Flatlines is fairly roomy in my opinion, but that doesn’t mean that your foot slides around inside the shoe. On the whole, I like the Bontrager Flatlines quite a bit, and they have replaced my 5.10s as my go-to flat pedal shoes. Riders concerned with absolute pedal traction are probably still best served by a 5.10 shoe, but many will be happier in the Bontrager Flatlines. That is great option to have. I used to have a pair of Bontrager Mt. Bike shoes about 8 years ago but they were like boat anchor heavy but withstood anything thrown to them like a tank. Looking forward on getting a pair of these new ones. So trek targeted 5.10 Freeriders and came up short. Bontragers have less grip than Freeriders and cost more? Oh, but they beat them by 140 grams /golfclap. No thanks trek… I’ll continue to roll with the “Gold Standard” of flat shoes. I find my 5.10’s to be too grippy. Takes too much fiddling in order to ‘set’ my foot where I want it. So I’ll be trying these out maybe. Another thing : the soles on the 5.10’s wear out incredibly fast. Getting sick of having to glue new tread onto them….always too grippy, and always wearing out too fast. Sick of it at this point.